A large range of all welded pallets with a choice of design options and sizes to suit almost every application. An essential element of any warehouse or industrial area, pallet cages are used to securely house industrial pallets to ensure that the workplace is kept safe. 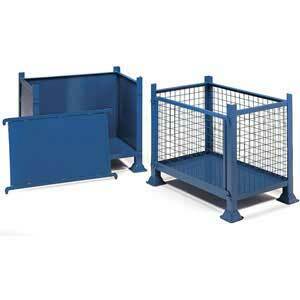 1 tonne detachable side mesh or steel pallets are designed to reduce the chances of accidents occurring. Pallet cages help to streamline and keep industrial areas tidy and ultimately will help to make a warehouse or workshop run more efficiently. They will also help to make storage areas organised and more accessible. Manufactured in the UK to a high standard, they have an all welded construction, and pressed metal feet to make them tough and durable. Each pallet cage has sides that can be easily removed to make them more accessible and reduce the need for heavy lifting. This makes them perfect for storing finished parts and work in progress. A wide range of pallets is available to suit a cross-section of requirements. 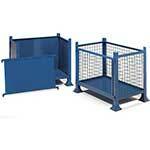 All have a 1 tonne weight capacity, and can be customised with either mesh or sheet sides. The cages come in a range of sizes; the smallest is 460mm high x 610mm long x 610mm wide; the medium size is 610mm x 610mm x 610mm square and the largest measures 760mm high x 915mm long x 915mm wide. These pallet cages can also be made to custom sizes.